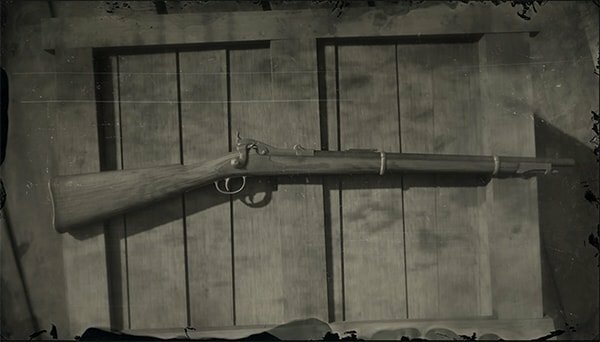 Springfield Rifle is a Rifle is Red Dead Redemption 2. The rifle that modernized fire power is the Lancaster Springfield, the perfect breech-loading rifle. No matter where you and your kin stood during the War of Northern Aggression or for Southern Independence, most will agree the greatest outcome of the engagement was the conversion of rifled muskets to the ease and convenience of the breech-loading Springfield Rifle. Rifled muskets fire only 2-3 times per minute where a breech-loading rifle can be fired up to 23 times per minute, a significant determining factor when it comes to disbanding bands of traitors or bringing them around to your side. A powerful hunting partner; With hounds baying in the distance you make haste with your Springfield Rifle at the ready. It is a pleasure to hunt with, whether you enjoy cooking up squirrel, opossum, jackrabbit, or raccoon. The action is keen, and there isn't a chance a varmint will escape your shot and miss being shared at supper. There are many kinds of beast that bother a man who toils the fields or moves cattle for a living. In the past, dispatching these animals required a crude slingshot, bow and arrow, or flinging firepots full of pitch or disease. While it is a great joy to observe a warren of hares being lit on fire, never to plague your garden again, it is the much more humane method to use the Springfield Rifle from Lancaster to end their days. Available at any Gunsmith after Chapter 1 for $120.